Urban Acreage: Christmas Traditions Tour - A Kid Friendly Tree! Christmas Traditions Tour - A Kid Friendly Tree! 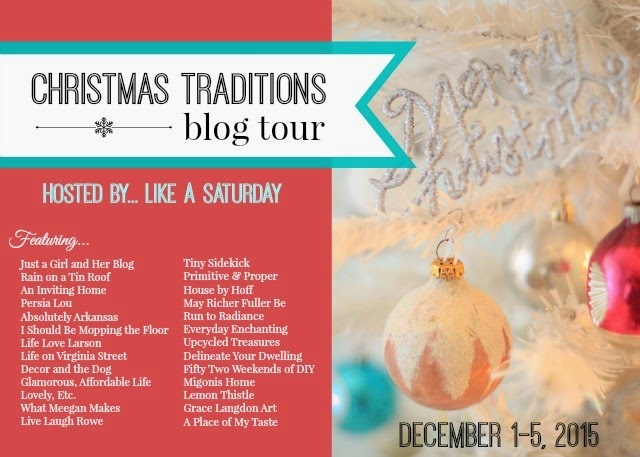 I was so excited when Rachel at Like a Saturday asked me to participate in her annual Holiday Blog Tour! This year's theme is "Christmas Traditions" so I thought it would be fun to share our new tradition of putting a kid friendly tree in B's room! If you are stopping by via Delineate Your Dwelling, and are planning to make some of Amy's yummy spritz cookies, please feel free to send a batch to me! We had so much fun decorating a Christmas tree in B's room last year that we decided to make it a tradition. I thought about doing a retro tinsel tree, but after spotting a couple of Scandinavian style dowel trees on Pinterest, I was smitten. I showed Jesse the pictures and he was able to whip this up in a couple of hours. I tell ya, I really don't know how I got so lucky. It's like living with a genie! We wanted the tree to be colorful and kid friendly (i.e. inexpensive non-breakable ornaments); so we used a mix of homemade, pre-owned and Target ornaments. Last year, we filled a bunch of clear plastic ornaments with brightly colored pom poms. This year, we had a great time squirting paint into ornaments and shaking them up to make pretty abstract spheres - a fun weeknight art project! After the dowel tree was finished and decorated, I thought it would be fun to add something holiday themed to the wall above the book ledges. I didn't want to spend a lot of time crafting something, so I searched Pinterest for vintage holiday prints and landed on this cute vintage Santa and Rudolph. A quick trip to Staples for an extra large engineering print (only eight bucks!) and we were finished! B loves showing off his tree to guests and telling them all about the ornaments we've made. I hope this remains a tradition for many years to come! Side note: I want to make a woodworking tutorial for the dowel tree(we took a few photos), but we have been so crunched for time lately, it might be July before it posts! The next stop on the tour is Christmas Eve fondue with Sarah at Life on Virginia Street, check it out! Here is a list of all the fabulous Christmas Tradition posts from the tour, Happy Holidays! oh my goodness! i love that tree and second andrea! I LOVE the engineering print! That is such a genius idea.